…and several minor ones too! 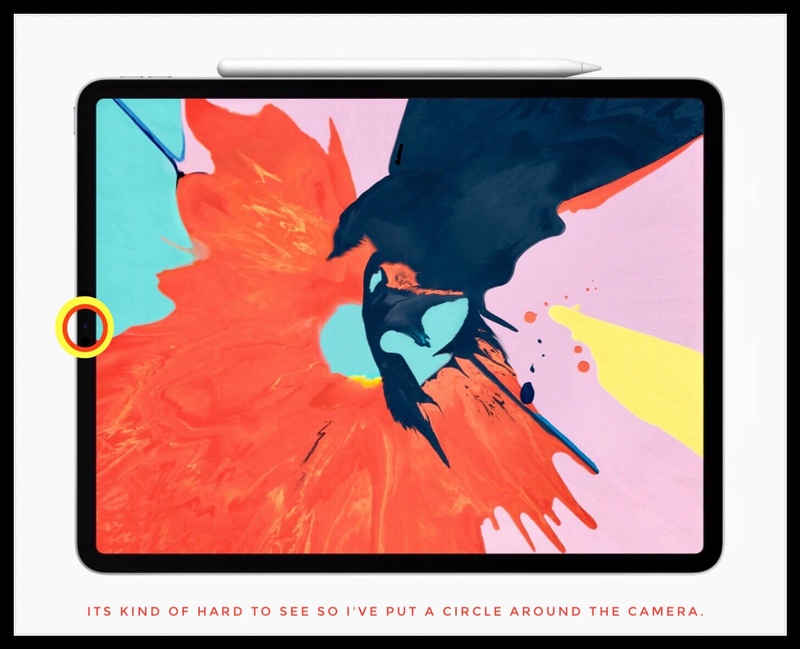 If You’re Buying the New 11″ iPad Pro You Need to Know About this Design Flaw! There are a lot of things to love about the new 11” iPad Pro, which I won’t get into here. Be assured that I do love my new iPad. That isn’t the focus of this post however. The focus here is on several design choices that Apple has made in the overall design of their newest iPad Pros. And how those choices impact users today, in 2019. Whenever a new one comes out I get it. 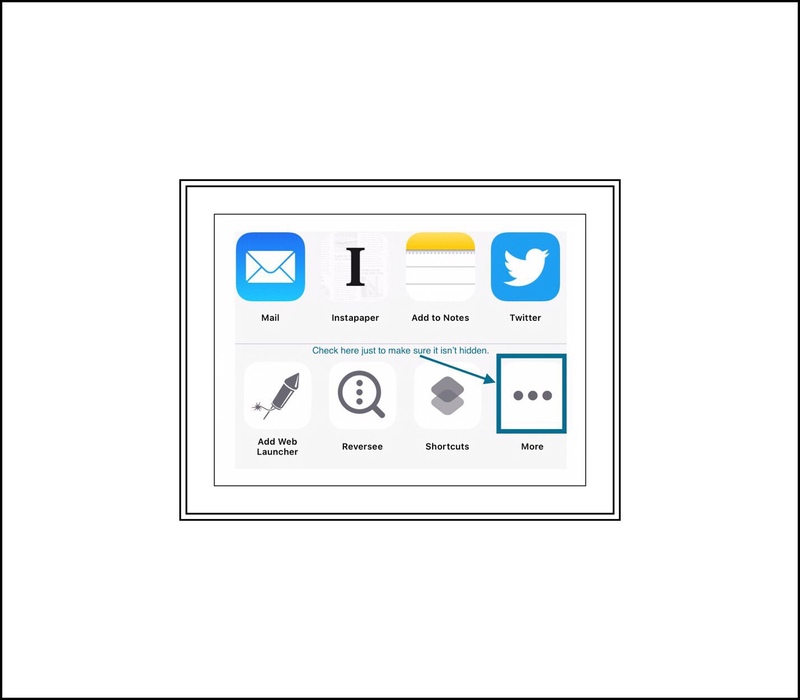 Primarily so that I can stay on top of Apple’s newest mobile technology for writing vsatips. That’s why it’s not a bad idea to consider my opinion when it comes to reviewing Apple’s newest smaller of their 2 iPad Pros…the 11″ version. This design flaw may also impact the 12″ version, but I can’t speak about that fact knowledgeably since I don’t own one. I’m not sure why that is, but I have my theories. It is clear to most people that things couldn’t possibly be as positive as they seem…always. That’s the primary reason I decided to write this review. 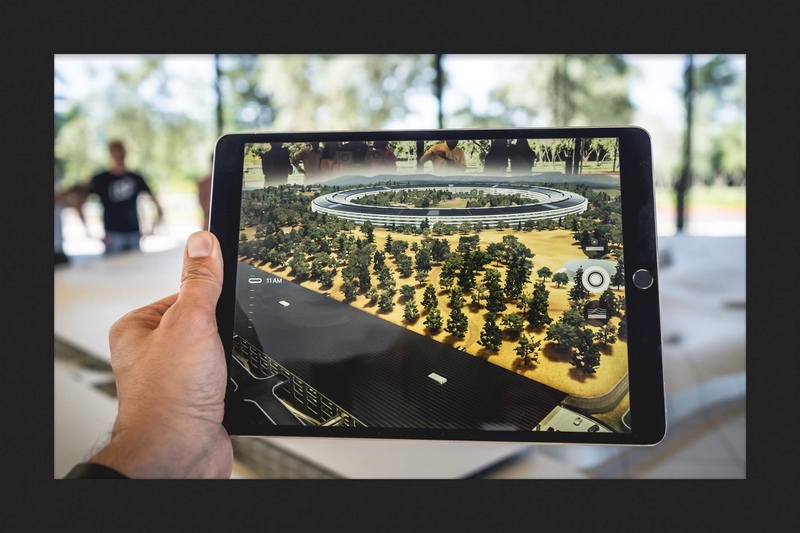 Many of the biggest review institutions in the US rely upon Apple and the other large manufacturers to give them models of their new products as soon as they come out (or oftentimes before they come out!) specifically for review purposes. It’s hard to look a gift horse in the mouth too closely! It’s also quite possible that in their haste to get their reviews out early (to beat other reviewers) they don’t test out new products as thoroughly as they could or as thoroughly as a real full-time user like myself would. 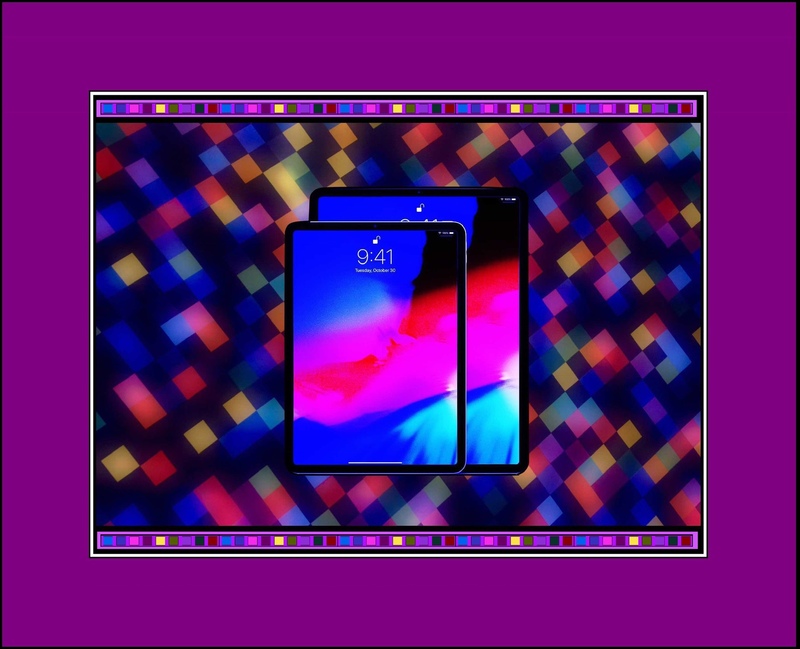 Whatever the reason, I buy (at full price,) almost every new Apple ios device that’s released and I write reviews or in-depth pieces like this one on single aspects when I think they are important enough to warrant it. Because I don’t rely upon Apple to give me this hardware I can be 100% authentic in my review. In addition, I truly do use ios devices to conduct all my work. I write, photograph, video tape, edit videos and produce movies, create and use multiple notes archives and keep all my important documents and files for both work and personal life accessible in some manner to ios. Literally everything that I do in my life is recorded in some manner on some ios device! It would be a great tool for a stalker if anyone cared that much about my life…although Apple’s commitment to people’s privacy might make that somewhat difficult! Phil Schiller introduces the new iPad Pros. But then that’s almost always the case. Apple doesn’t usually bother releasing new products just for the sake of pushing out new products alone. There has to be some compelling improvements for them to do so. 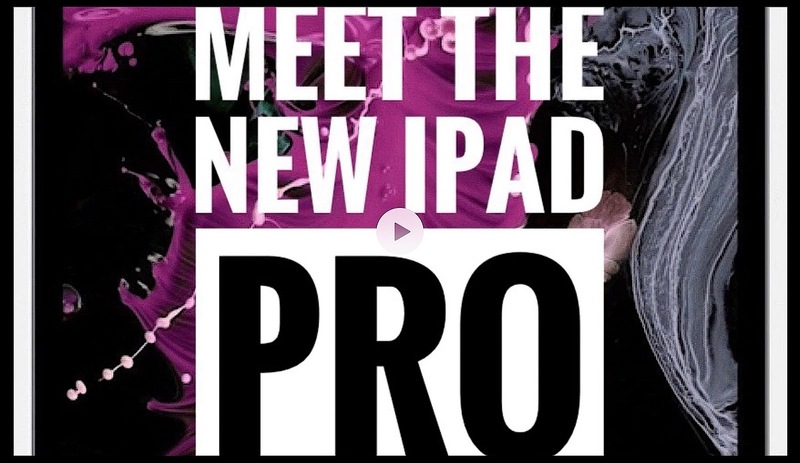 Consequently, there are a lot of great things to say about these new iPads! Without exception all of these positives have been written about or vlogged about numerous times already…so I won’t repeat all that here. I watched and read a lot of reviews before making the decision to buy the 11″ model. I was extra diligent because I knew my husband was interested in replacing his iPad too. We ended up getting 2 of the 1 TB cellular models. I’ll include links at the end of the post to articles and videos that I found most helpful when making my buying decision. I have to temper my enthusiasm for my new iPad Pro somewhat by our somewhat marred user experiences. Both my husband and I are continually frustrated by one major flaw that appears to have been easily avoided, as well as a couple of minor ones which are daily reminders that Apple makes mistakes too. Most Reviewers Don’t Mention This Pretty Significant Problem at All! It seems like this problem has been missed by almost all of the reviewers! All except one that is. A short clip from DetroitBORG’S video review. Poor placement of the ‘selfie’ camera (or the camera that faces you as you’re using the iPad,) which interferes with the functioning of Face ID. This camera is the same one that you’d use for selfies, or for making video calls using FaceTime, Skype, Alexa Calling or you name it….virtually every video communication app currently available utilizes this camera. The problem is that oftentimes when users need to utilize Face ID it doesn’t function at all because the camera is covered up by their left hand hand…or really their left thumb, because of the way that most people hold their iPads. 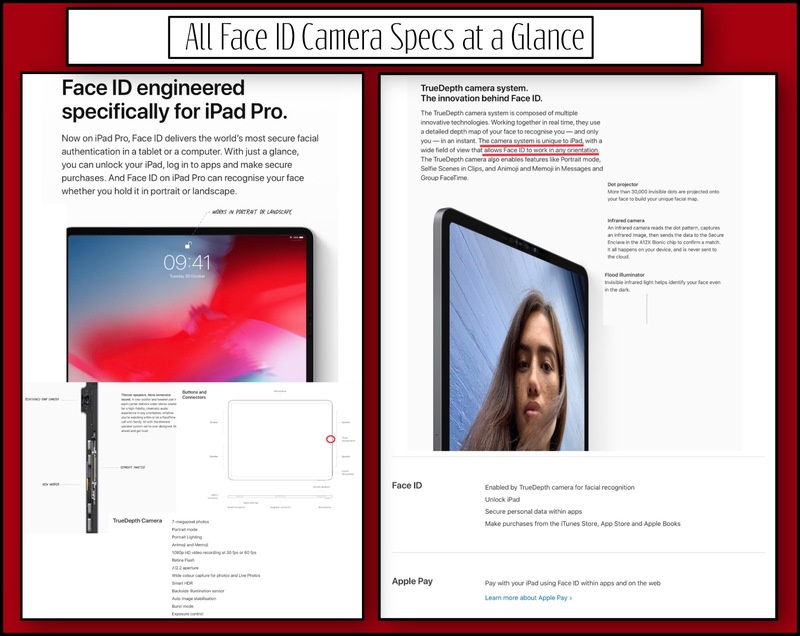 Above: The photo above shows where the Face ID camera is located on the 11″ iPad Pro. The problem emanates from another (poor?) design decision Apple made. Just in case you’re unaware, Apple removed the Home Button on their newly released iPad Pros. With the Home button gone Touch ID is impossible. Therefore Face ID becomes the only method available for unlocking a device. What isn’t necessarily loved is how Face ID performs on the new iPad Pros. When Apple removed the Home button, they also removed Touch ID completely as a method for securing your devices. Touch ID has been replaced 100% by Face ID. That by itself wouldn’t be such a bad thing. The bad part is that Apple released Face ID before it was ready for Prime time! Apple does appear committed to making the necessary improvements to make Face ID work in the long run. In fact, their second iteration of Face ID does work much better than their first one did. The first iteration was really spotty for people who wear glasses (like moi!) and for a few other outlying exceptions. While Apple states that in general, most people have been pleased with the new Face ID feature…I suspect that may not necessarily be the case. This whole situation seems to be one that is representative of a new kind of pattern I’ve been seeing lately. Where Apple releases a product or feature that has some pretty significant problems and they state that the problems don’t really exist. Or they may minimize the degree of the problems or suggest that they don’t really impact very many people. Then, behind the scenes, they work like crazy to get the problems solved! The volume and severity of the problems that are impacting brand new products seem to me to be increasing at a fairly significant pace. So much so that it appears to me that Apple went from only allowing developers to beta test their software, to allowing anyone who wanted to, and then progressed beyond that to what we have now. Which seems to be a situation in which Apple appears to be beta testing all of their new software (and maybe even some of their hardware) on their entire user base! Has Apple’s entire customer base become their beta testers? I was OK with the improvements to FACE ID version 2, up until our very recent holiday trip to Cuba. While we were there I discovered that Face ID caused me to repeatedly miss one great photograph after another, either because it was too slow or because it wouldn’t work at all. If my phone was upside down, or if my hand covered the camera, or who knows what other little aberration would arise when I’d quickly pull my phone out of my pocket or purse to capture something. If Apple could improve battery performance enough to allow me to do so I’d leave my iPhone awake all day long. But right now that’s impossible without my battery completely draining. The rate of drain still seemed to be faster than that of my Android using companions. This was despite the fact that my iPhone X wasn’t using any kind of networking at all…be it cellular or WiFi or possibly even something else. My main point is that background tasks weren’t ever running. Just to make certain that I didn’t accidentally incur huge roaming charges I turned cellular off completely as well as individually for every single service on my phone. So did the rest of my family. Oddly, we all experienced a few weird occurrences like receiving a text or in my case a phone call…even with everything off! I mention my iPhone X problem here for a reason. Because the newest iPad Pro Face ID problem occurs for the same kinds of reason as those with my iPhone X. The Face ID camera can’t find my face! In the case of the iPad Pro, the location or placement of the Face ID camera is the main problem. In situations where I’m repeatedly missing out on tons of great photos with my iPhone X I think the problem lies more with Apple’s software not working fast enough to orient the Face ID system to the correct scenario that applies to that specific situation. If you hold your iPad in the landscape orientation position like the images a little further down depict (and like most iPad users do,) your left hand completely covers this little camera. Some examples of some problem grips. Even more examples of problem grips. Along with securing your device Face ID is also used for many other functions. Buying an app from the App Store (even if it’s a free one!) requires the use of Face ID. Using a password from either your Apple Keychain or from another password manager such as Dashlane also requires the use of Face ID. Using Apple Pay is one more tool that requires the use of face ID. 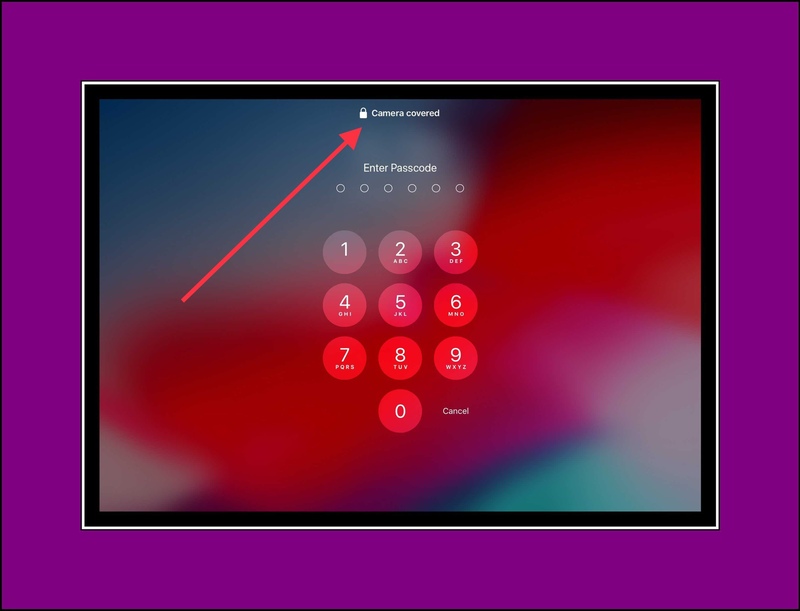 Accessing your account in the App Store changing many settings in the Settings App are 2 more examples of situations where Face ID usage is necessary. My main point then is that most users end up using Face ID a lot more than they initially realize! When Face ID doesn’t work very well, everything that you do becomes more cumbersome. Don’t even get me started again on how many potentially incredible Cuban photos I missed because of Face ID on my iPhone X! I’m still not quite over it. One more example of someone who’s going to have a problem with Face ID. Above: Even one-handed holders will most likely cover the camera. This other aspect makes the problem a little more serious for brand new owners of the iPad Pro. He suggests that when this Face ID problem occurs it’s a simple and quick fix. While the fix may be simple…it’s far from quick. Worse yet is that the problem completely confounds new users. Because, initially new users don’t even know why their iPads aren’t unlocking correctly! No error message is provided initially and you’re left to just random, often futile attempts at unlocking your iPad. It’s definitely odd how both my husband and myself experienced the problem initially with no assistance for ios on how to resolve it. Then around day 3 or 4 of our ownership we both began receiving error messages like the one shown below. 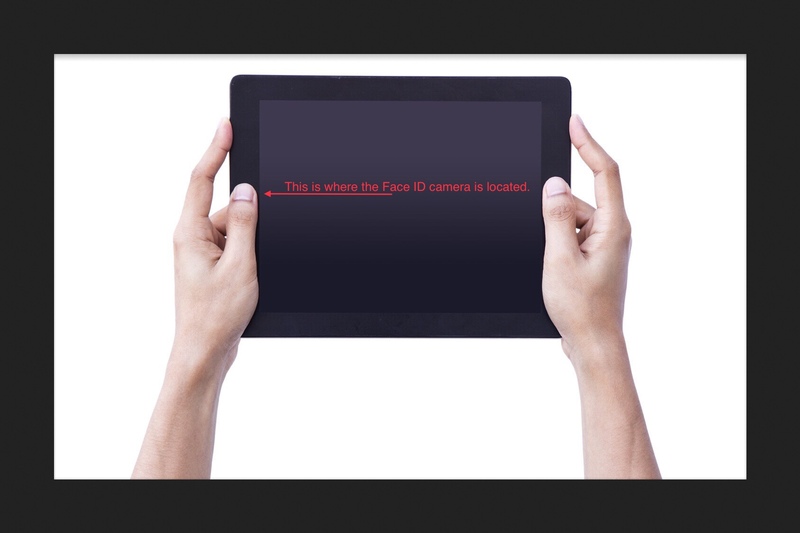 This is the error message telling you that the camera is covered. Unless it was some odd coincidence, once we began receiving error messages, we began receiving many different forms of this message depending upon the circumstances. This is a true design flaw just like the design flaw that Apple made when designing iPhone X. It used to be that if iPad users wanted to take a screenshot they would hold down the Power button and the Home button at the same time. This was pretty easy to do because you could hold down one button with each hand. But with no Home Button, Apple had to come up with an alternative option for screenshots. The option they chose to go with is sort of a standardized one in the industry for Android users…which makes sense on some levels. It makes it easier for people using both platforms or for those who switch, to remember the correct procedure. The problem is that the way the buttons are pushed so closely to the edge of the rim…closer than on most Android tablets, combined with the different work flow that people now need to get used to, makes for very awkward maneuverings with lots of accidental ‘Power Off’ incidents too. Naturally powering back on requires Face ID which takes you full circle back to Problem number 1! Some days I seem to find myself caught in this endless loop of failed Face ID’s, failed screenshots and very little work accomplished! 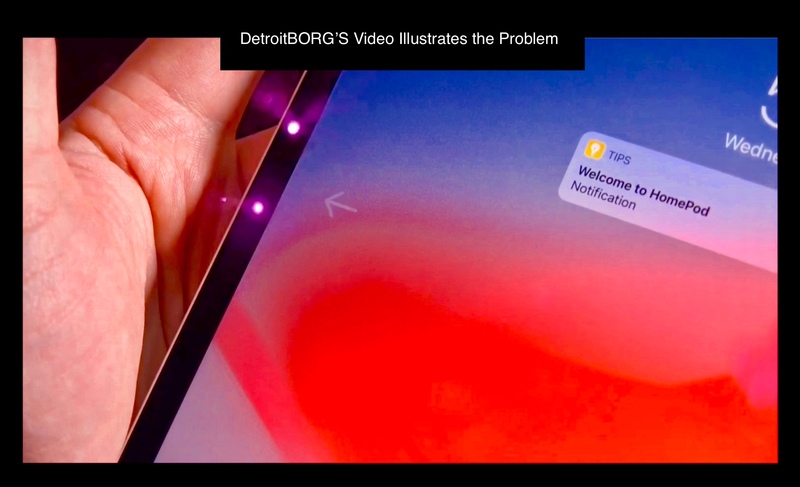 Popular YouTuber & Reviewer Rene Ritchie Published a Video Recently Speculating about the Return of Touch ID on iPhones…but its not what you think. That’s 3 Major Design Flaws Involving Apple’s 2 Most Popular New Devices Which Introduced Brand New Problems in 2018! I wonder how many people have really heard about these flaws? It seems to me, given the magnitude of these flaws, that the vast majority of reviewers who write about Apple mobile devices have a definite tendency to just talk about the positives and to ignore any negatives. Apple really needs to test these things out before setting them loose upon the public. You can watch YouTuber JerryRigEverything’s brutal iPad Pro review below. The reason I didn’t initially find this potential flaw all that worrisome is because I had the original ‘bendgate’ iPhone. I never had a problem with it. So either it’s tendency to bend was over-hyped or I don’t engage in the kinds of activities that can bring about the problem. In any event this wasn’t a flaw that I was seriously worried about. Until I ran across this PC Magazine Article. The tally for Apple’s poor design decisions is growing! Which makes this next image I found on Unsplash very appropriate! 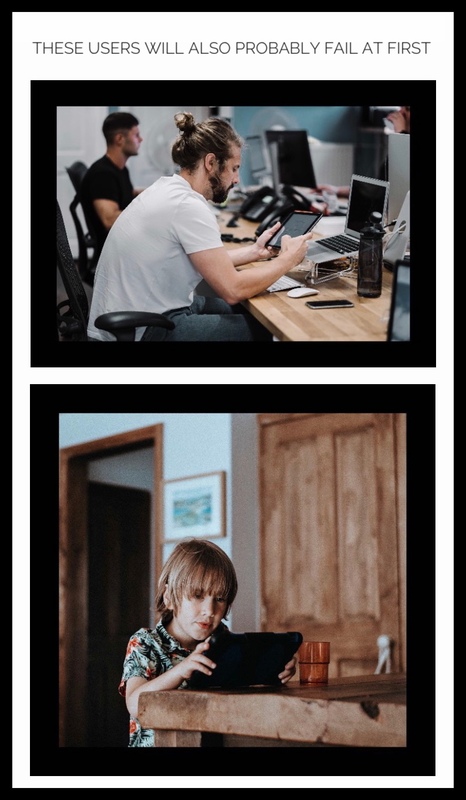 An ironic image I found at Unsplash while writing this post! AnandTech’s review will primarily appeal to geekier readers because it includes a lot of benchmark kinds of stats. Marques Brownlee is one of my favorite YouTuber reviewers and I hope you’ll enjoy his review as much as I did. The Verge’s review is actually a bunch of reviews rolled into one. A great video in which they say a ton of positives but ultimately aren’t very positive at all about the new Pros. Reason being, what I’ve said for years…despite the huge amount of raw processing power that these tablets have, Apple will never allow users enough control to actually use them the way a laptop is used. There’s also an extensive written review and a great video review of Pencil. Cult of Mac is another favorite reviewer of mine. This review is interesting in that the reviewer obviously uses iPads as much as I do…yet he has very different takes on many aspects. I suspect it’s because he uses, as his iPad of choice, the larger Pro with a keyboard whereas I use the smaller Pro with no keyboard. But regardless of our agreement he presents many valid points in a sea of over-gushing reviews! DetroitBORG’S Unboxing Video of both iPads is probably the best handed on overview for serious buyers. In fact he’s the only reviewer I found who even noticed the design flaw! Sadly, what he states was not true for our experiences…both for my husband and myself. Initially when Face ID didn’t work we didn’t know why…or even that it wasn’t working. Our iPads just froze. But after a while we started to get the increasingly loathed…’Camera is Blocked‘ error message. If you’d like to leave a comment, you can do so by scrolling down the page a little way until you see the small comments box. 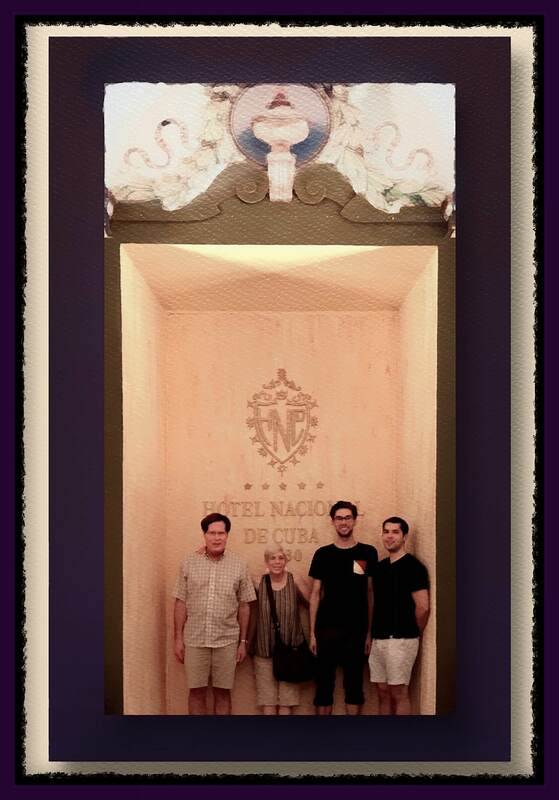 My family and I on Christmas Day 2018 at the Hotel Nacional de Cuba in Havana. This is one of a very few government run hotels that the American government allows Americans to stay in. I’m writing this from the Plaza Hotel in Havana. I’m here with my family celebrating the Christmas holidays. We were supposed to have been on a Royal Caribbean Cruise because we believed that individuals couldn’t go to Cuba alone, without being part of a pre-planned group. Through a series of errors and miscommunication we weren’t able to take that cruise, but those problems are for another, longer post. What appeared to be a huge problem, causing us to lose all of the money we paid for the cruise ended up being the BEST THING THAT COULD HAVE HAPPENED! Here’s why. We discovered that it’s easy for individuals to travel to Cuba alone and we’re having a fantastic time! Much, much better than we would have had on the very limited and poorly managed Royal Caribbean Cruise. We’re staying at an AirBnB that our adult son found. I’ll write more about how fabulous that’s been later…but for now I just wanted to share where, in case others are interested right now. Below is a screenshot of where we’re staying. This is our host’s marketing pamphlet. You can book all of his rooms using a variety of methods. Either directly by emailing him, or through AirBnB or Bookings.com. The key to getting here is getting a Visa, which you do via American Airlines. You don’t need to actually fly using American…but you do need to fly through the Miami airport. You buy a ticket to say, Havana, via Miami. Once in Miami you need to leave your concourse and go to American Airlines ticket counter #7. There’s a little booth that’s sort of surrounded by American Airline’s kiosks, which has one or two officials standing there waiting to sell you a Visa. The cost is $100 and they will only sell you one if you already have your flight booked and can produce your boarding pass for them to stamp. If it’s an American boarding pass they will have already asked you at the ticket counter why you’re traveling to Cuba. When the American Airline’s ticket agent asked us that question she included our answer within our digital travel record. So all we needed to do was present our boarding pass, pay $100 per person and get our boarding pass stamped. Then we were on our way! I suspect that you may need to fill out some kind of form. What I am sure of is that regardless of the airline you’re flying on, you are able to procure your Visa this way. It’s instantaneous and so much easier than the longer, more typical method of going through the Cuban Embassy. *Since we’ve arrived back in the states and have internet again (we’re in Miami currently for our last few days of vacation) I’ve finally been able to do a little more research regarding flights. We met several other American families who were also traveling independently while in Cuba. We discovered that there are more alternatives available than we’d realized. See below under the ‘After Thoughts‘ section at the end for more information. Once you arrive in Cuba you will need to present the Customs Officials with 2 forms. One appears to be a generic one that just reiterates the details and of your airline reservation. The other is a health form that supposedly is needed for arrival…but no one actually was asked to produce this in Cuba. We did walk past several tables with signs that appeared to be for this purpose during our arrival, but everyone on our flight was just waved through. We were told that customs would tear off 1/2 of the generic looking form…because it repeats your flight information on both sides…but again, no one did. Later, upon closer inspection, we figured out that this document was actually our Visa. We were told the duplicate section would be torn off when we left Cuba. That did happen for all family members except me. I don’t know if they forgot or what…but no one tore mine off. At one point during our arrival we did talk to a Customs agent too but no one remembers that conversation…it was unremarkable. The whole time we were half expecting someone to stop us and tell us that we had to turn around and fly back to the states…because we weren’t allowed to come as a private party with no organized entity behind us…but that never happened. When we walked out into the main, open part of the airport, we breathed a sigh of relief, found our luggage, got a cab and proceeded on to our AirBnB. Even our son who booked the AirBnB didn’t really know what to expect. As we approached the somewhat rundown looking building in the even more rundown looking neighborhood, he said “Mom and Dad, if this doesn’t work out we can look for a hotel in the morning.” We were all pleasantly surprised when we received the warmest welcome we could have possibly imagined. Our accommodations, while sparse in comparison to US standards were more than adequate for our weeks’ stay. The hospitality more than made up for any slight inconvenience we might experience in the following days. I intend to (and will hopefully follow through) with writing much more about our AirBnB and ‘traveling to Cuba’ experience since it appears that there’s significant confusion amongst Americans about these aspects. We didn’t get all the answers while there, but we feel that our experiences combined with a significant amount of research once we were back in the states will help to shed light on many of the misconceptions most Americans currently hold. Misconceptions like, that Americans need to be part of a group that participates each day in a full day’s complement of strict and narrowly focused activities in order to comply with some vague, oft-repeated but never documented ‘law’ that states this. I’ve searched high and low for days for any documentation like this…it simply didn’t seem to exist beyond the confines of the writing at many of the websites offering group paid tours and cruise lines offering pricey itinerary’s that comply. At one point in time we believed that much of the misinformation that’s flooding the internet regarding American’s traveling to Cuba was fabricated by the companies who are profiting handsomely from it. But we now know that isn’t true because we were finally able to read a copy of the entire set of laws and restrictions, which I’m including here too. In the meantime I just want to say a few things about using AirBnB in Cuba and about our experiences. First, we were pretty shocked to find that AirBnB’s even exist in Cuba…because it’s an American company. The hoops that Cubans have to jump through to be on AirBnB are considerable, but we found that there is a great number and variety of choices using them. 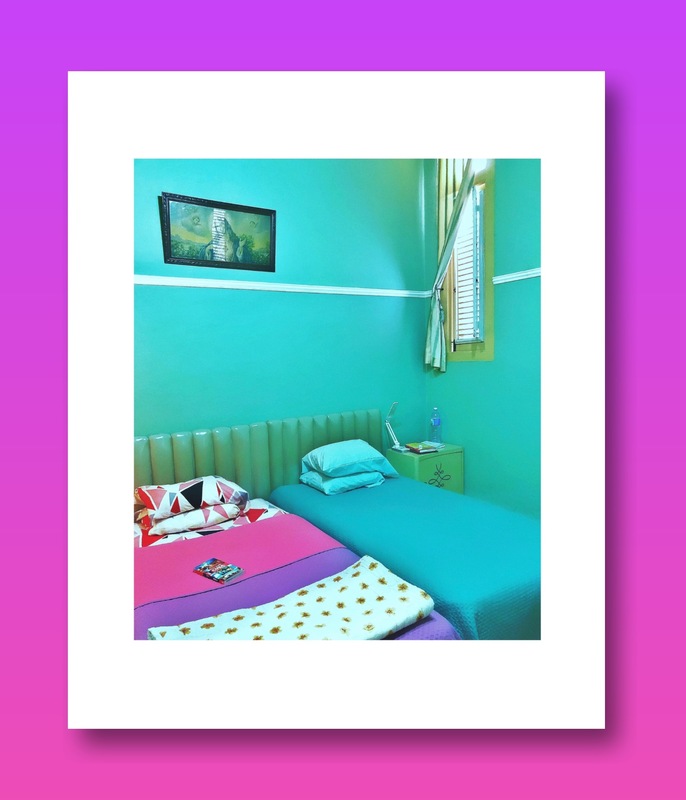 Most AirBnB’s in Cuba fall into one specific category of accommodation called casa particulares…which are essentially Cuban bed and breakfasts (although a true vacation rental can also fall into this category.) 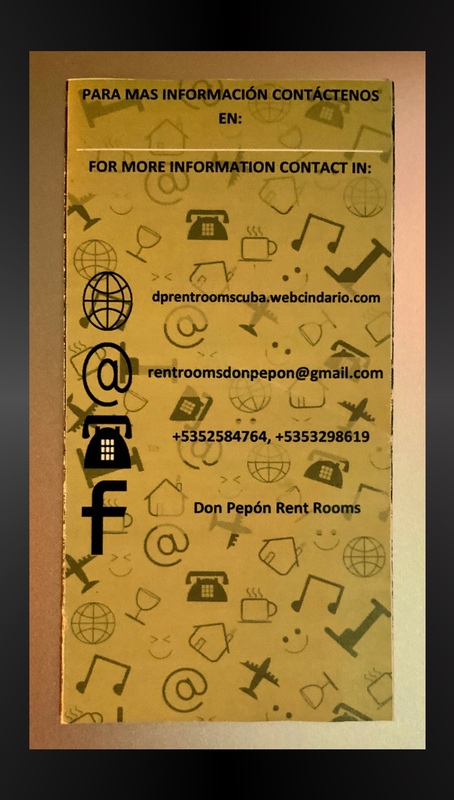 If there’s any truth to any of the current stated restrictions upon Americans then staying in a casa particular or a private rental is by far the best way to connect with Cuban people during your stay. The long, heartfelt conversations we shared with out host, his family and friends educated us far better than some organized educational group experiences ever could. Alongside our hosts, we shared (and ‘lived’) their experiences with the overwhelming number of product shortages that fulfill so many of people’s basic daily needs. We were equally frustrated when our brilliant ideas to address problems their businesses face were shot down, one after another, because of their unique circumstances. It would be difficult to overstate how much better our experience was because of our accommodation choice. Eddy, the main proprietor of Dom Pepons, our casa particulare is AMAZING!!! He welcomed us with open arms into his family and they all made us feel like a part of their family too. Btw…Dom Pepon was the name of Eddy’s deceased grandfather. Our accommodations included 2 rooms with 2 twin beds…both with en-suite bathrooms and some of the best air-conditioning units we’ve ever experienced while traveling! Was everything perfect with our rooms? Not necessarily…but this was through no fault of Eddy’s. It’s because so few of the basic needs that we so heavily rely upon are even available there. Those that are available oftentimes require significant effort to procure. Eddy bent over backwards, as did his family, (his family is primarily his staff,) to fulfill our every need and request. We were provided with meals upon request and given several meals just because. Our first morning’s breakfast and Christmas night dinner were superb and ‘on the house.’ In fact, Eddy invited us into his own home on the floor above us to dine with his family for Christmas dinner…and he did all the cooking himself! This was the night we arrived and our only regret was that we were all too exhausted to stay up late and enjoy all of their festivities. The mental strain of the last 24 hours finally overtook all 4 of us once we were safely and comfortably ensconced within Eddy’s wonderful home. One kind of humorous note is that we asked for a box of Kleenex in our bathrooms. Our request was met with a blank look. The next day while on a previously booked ‘Overview of Havana’ tour, I asked our tour guide because his English was flawless. I did it at a point during the tour when we’d arrived at what we were told was the largest shopping ‘mall’ on the island. Using the word ‘Mall’ was a bit of an overstatement! I asked our guide if I could try to find some Kleenex. He too just looked at me with a blankness that indicated to me he had no idea what I was talking about. I tried to explain…but he truly was confused by my question. In the end I got my answer when I asked him what he used when he wanted to blow his nose. A look of enlightment spread across his face. He finally knew what I meant and he told me they just use toilet paper for that. Later in the week I talked to another family staying at one of the very expensive government run hotels (expensive because of all the additional charges that were tacked on at the end.) I was surprised to discover that they did have a small box of Kleenex in their bathroom. We decided together that their Kleenex was probably added just for the comfort of tourists. That, in a nutshell is our experience about just how easy it was to travel to Cuba in late 2018. A friend recommended to my son that we acquire WiFi cards because there are no cell service plans even just for calling for Americans. There’s no public internet to speak of either. The reason I’m sitting in the Plaza Hotel writing this is because they have, perhaps the only WiFI Card in Havana that works all across Cuba…as long as you’re in a Hotspot location operated by ETECSA. I’ll write much more about that in a later post too but for now, my WiFi time is up for now. One additional thing I’d like to note is that our understanding of how these WiFi cards operate within their own networks is still puzzling to us. The fact that we used them successfully and had ample time to question people people about the various networks and how they operate, yet we still seem to lack good understanding of many of the basics is indicative of just how complicated so many simple things that we take for granted at home are in Cuba in late 2018. I’ve been told and suspect that it’s at least partially true, that the WiFi Cards we purchased at the hotel Plaza, which function everywhere within Cuba, aren’t really unique in that regard at all. And that any WiFi card purchased for that network will work anywhere within the country. I still need to research that subject further to discover the truth and to be able to write knowledably and give proper advice for WiFi Cards. Scroll down in the Q&A’s to find this section. 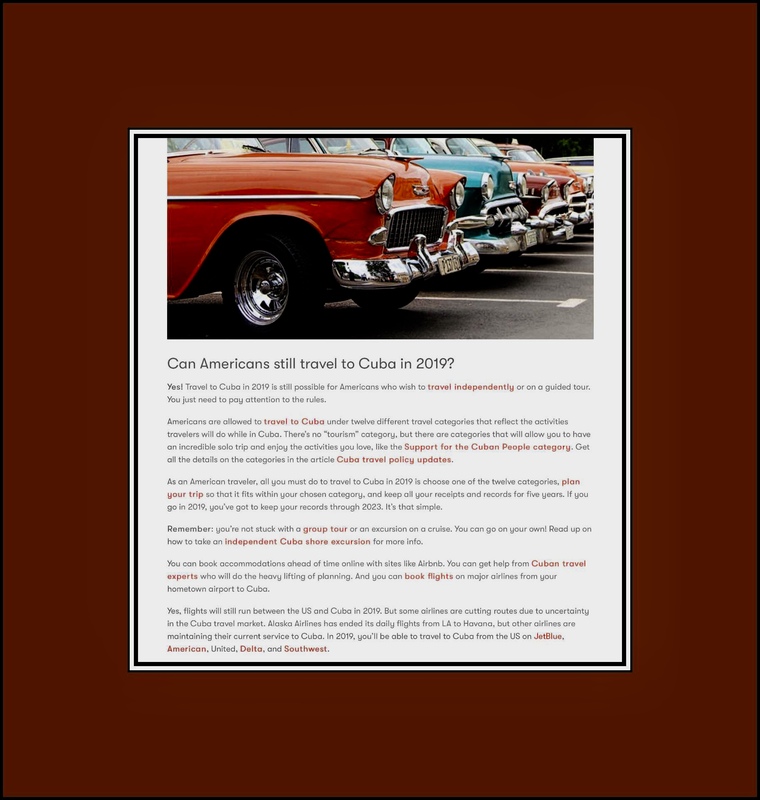 A website I ran across while planning our trip has a great little blurb about Americans traveling to Cuba in 2018. You’ll find more information about which airlines fly to Cuba from the USA in the Questions & Answers section. My favorite sleeve for the 10.5” iPad Pro with my husbands new 11” iPad Pro inside. Apple’s newest 11″ iPad Pro May be expensive (over $2000 for the 1 TB sim enabled version along with the new Apple Pencil) but a new case for daily use needn’t be. If you’re the kind of person who doesn’t like to use folio style or keyboard cases like we are, an iPad sleeve is the perfect non-case. 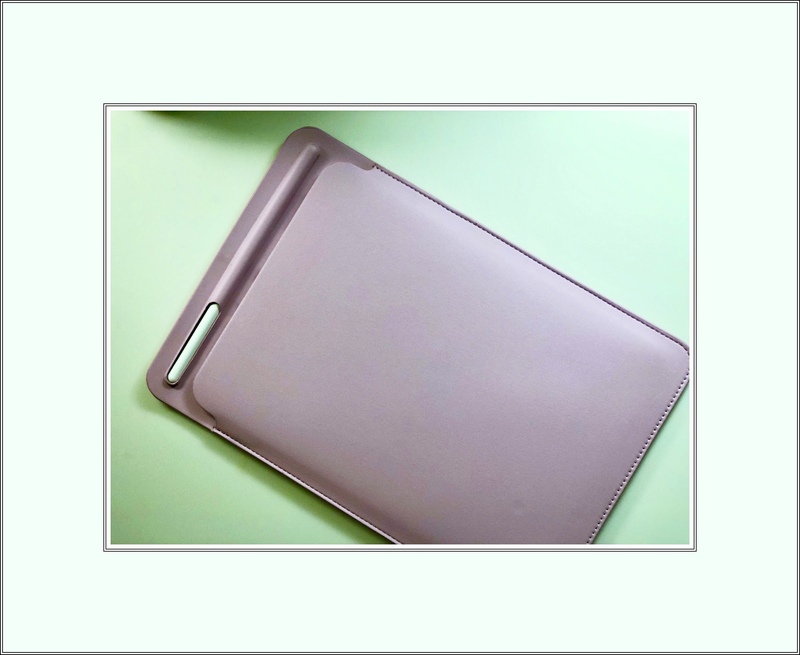 It provides protection while carrying your iPad around with you and when you arrive somewhere and want to use it you just slide your iPad out and use it in all of its pristine, ‘uncased’ glory. A simple sleeve is truly the best of both worlds…protection when you need it and an unencumbered case-less iPad when you don’t. Both my husband and myself are in the midst of getting the newest 11″ iPad Pro along with the new Apple Pencil 2…and we need sleeve-type cases relatively quickly. With the addition of needing to house the Apple Pencil too, our choices are much more limited. So I’m compiling a shortlist of my favorites from Amazon for us to choose between. Because Amazon has always been where we’ve found this type of case in the past. This design is a new one to me. It looks well thought out. This unique Toovren sleeve is on the high-end of prices for our ‘inexpensive category’ but it makes up for that in its ingenious functions. 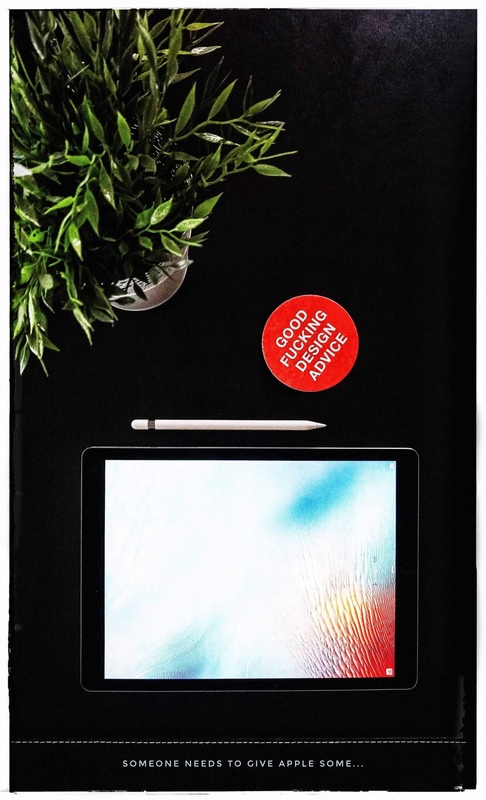 Although Pinhen’s Sleeve says it’s made for the 2017 iPad Pro, I know for a fact that it works just fine with this years new 11″ model because I own it in pink, although the pink version is no longer sold. IMO it’s the ultimate in terms of simplicity. Oftentimes Amazon sets up little storefronts within their bigger online shopping website. These can be great it you know when and where to look for them. A perfect example is this iPad Pro Case Store Front which I only discovered towards the end of my search! You can reach the storefront here. That means I earn a tiny commission if someone buys a product I recommend. You can read more of the details about it in the screenshot below. Above: So far we love our new HP 7855 Envy. The 7500a it replaced was a disappointment from day one. Recent changes HP has made to their ios apps have caused a lot of confusion about which app to use as well as introduced a bogus app that’s ripping off tons of HP and Apple customers. 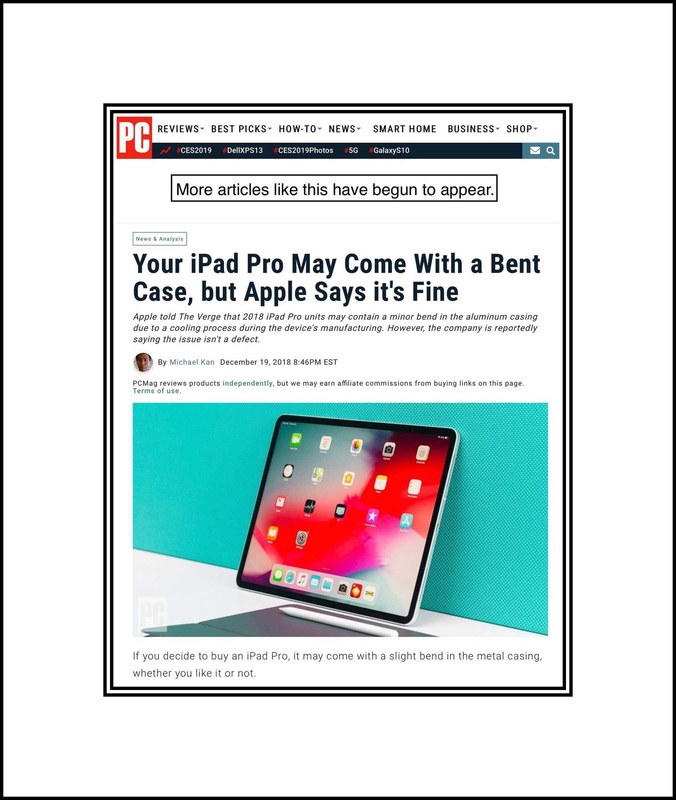 What may be worse is that unless you’re very careful in your app selection you will be shelling out over $150 a year for nothing and you’ll lose basic Apple features like the ability to print or create PDF’s from within Safari. This article describes how to avoid these unnecessary charges and provides a link to the correct HP App too use. I also show you how to restore the Print command in Safari. This is a big problem because I use Apple’s awesome Print to PDF utility all the time. If you’re unfamiliar, that gives you the fastest way to save an entire webpage. I save them in Apple notes but you can save them anywhere you like. If you need to learn how to use Apple’s great utility for saving webpages you can read my article which teaches you how to turn any webpage into a PDF that you can save offline using the Safari Print command. But I can’t do this without the Print utility! 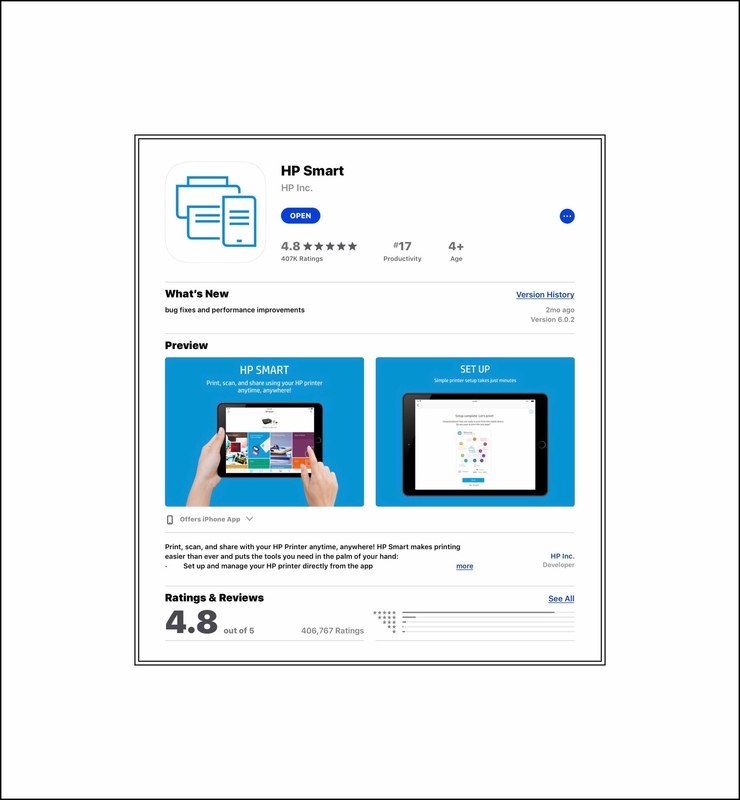 HP…Why Do You Allow a Scam App on Your QuickStart Printer Guide? In What Ways is ‘Tap to Print’ a Scam? The app misrepresented itself as being by HP and aggressively took over everything related to the setup and management of our new printer. The app didn’t say it was a subscription based app that cost $15 a month! The app secretly placed me on a subscription despite having deleted it right after realizing my mistake. The app gets awful reviews because apparently it doesn’t even work well. When you try to visit the apps support site it’s nonexistent. When you try to contact the developer there’s no way to do so. 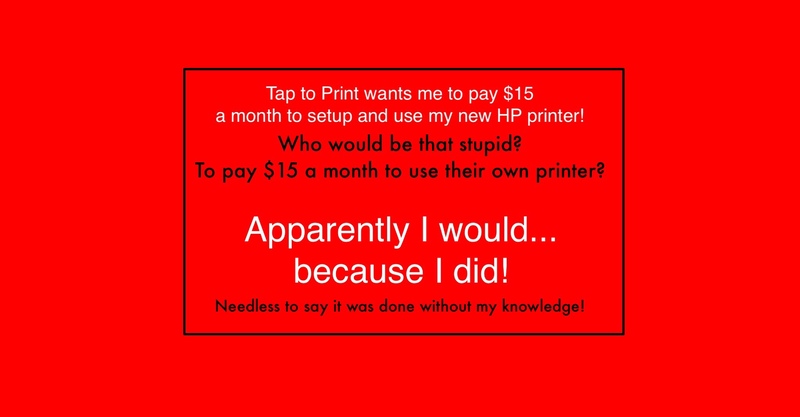 It’s unclear to me if HP even knows that they are causing this widespread problem by their including a link to this Tap to Print company who’s clear purpose in life is to rip off customers. Sadly, it’s not just HP that’s involved. 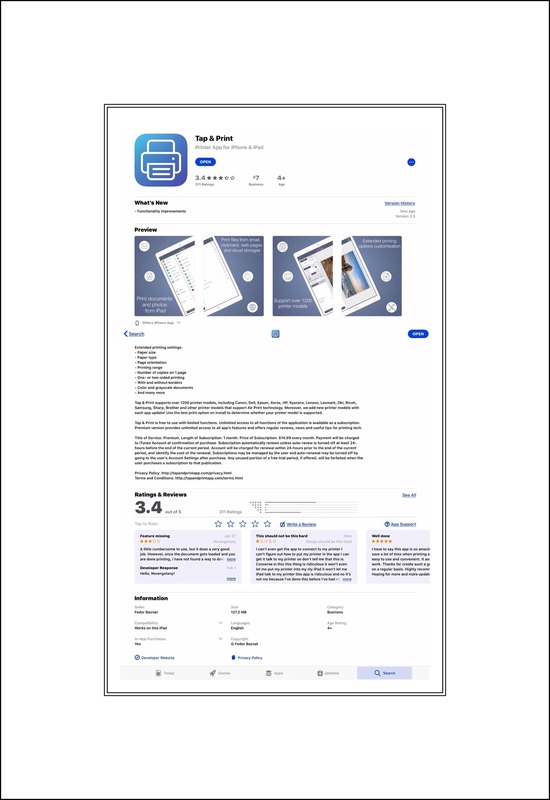 It became obvious to me when reading about the app at the Apple App Store that this app is being marketed to owners of many different brands of printers. You can refer to the screenshot below to see all the printer brands that this scam is targeting. Below is a screenshot showing what the app looks like in the App Store. Here’s a link to the app too…but PLEASE BE CAREFUL! Don’t download it or you run the risk of starting the $15.83 per month subscription. I’m providing the link purely for research purposes…not for downloading! Below is a screenshot showing the webpage you arrive at when you click on the ‘Developer’s Website‘ in the App Store description. Last, here’s a screenshot of the apps most recent reviews. Close analysis will reveal one or 2 terrible reviews and then 4 or 5 perfect ones. One clue that the perfect ones are bogus is that they are always all written on the exact same day! “Tap and Print’s developer appears to be from Japan. His name is Fedor Baznat. This only appears to be his 2nd app. But it’s been a highly successful one for him! Which HP App Should You Use? There is only one HP App now that serves all of the main functions you used to need several apps for. Needless to say (I hope) is that it’s free (as are all Hp apps!) If you install this app, the correct app, you won’t ever experience the disappearance of the Apple’s Printer icon! Because it’s the over aggressiveness of the scam app as well as HP’s lesser quality apps that works to block Apple’s stock Print utility. The app you want is HP Smart by HP. Below is a screenshot of it. HP Smart replaces HP’s old ePrint & HP All-in-One Printer Remote Apps. Both of these apps have been discontinued however if you owned the ePrint one previously you can still download it. Don’t make the mistake of confusing that ePrint app with another one which is still available for sale. It’s called HP ePrint Enterprise. The reason you don’t want that one is because of all the horrible reviews AND because if you have it on your devices it blocks Apple’s Print function from appearing! Then try searching using words that hopefully are familiar to you and your device…like Print or Printer apps or HP into the search bar. Once you find any offending app just delete it. Don’t worry, you can always reinstall it if need be. 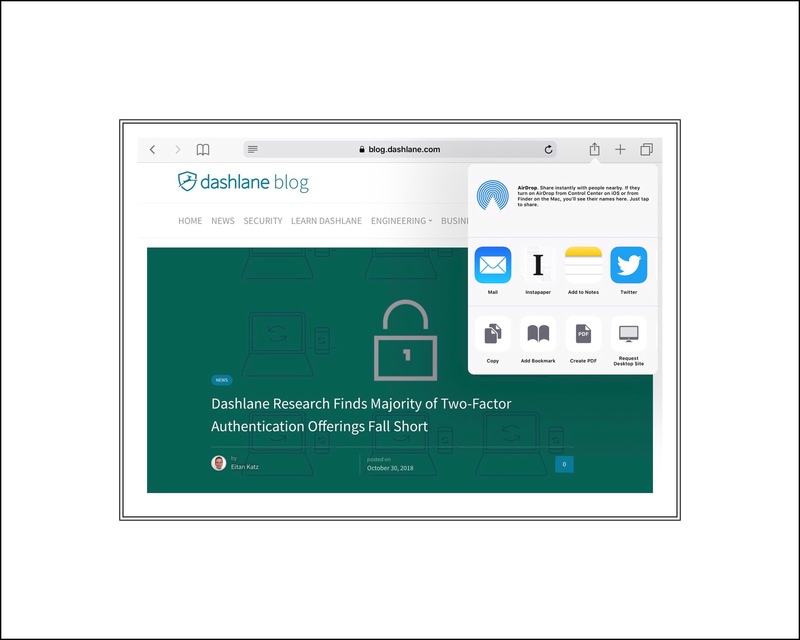 Here’s what my Safari Share Extension menu looked like before and after I deleted HP’s ePrint Enterprise App today, which ended up being the cause of my problem today. If you’re still having problems finding it, make sure that you scroll all the way to the end of the bottom menu in the Share Extension and tap on the three dots which opens another longer menu of everything that could appear there. Check to make sure that Print isn’t just unchecked or hiding which would prevent it from appearing in the menu…see below. It’s really easy to report any app to Apple’s App Store. Of course it’s a good idea to leave a lousy review for the app too. But the easiest way to report it to Apple is to use their ‘Report a Problem‘ webpage. You can use this same reporting feature to ask for refund if you were taken in by this app the way that I was. You can even go to Apple’s main support page and request that a support person call you and then request a refund in person. I mention this only because it appears several Apple users didn’t get refunded because they didn’t know where to ask for a refund. The phone support option I think works best in this scenario. You can read about what that means in the following screenshot.